Security is no longer just about protecting information, it is critical to maintaining trust with customers and protecting the organization’s brand and reputation. Breaches cause customers to take their business elsewhere, resulting in material and substantially negative impacts to an organization’s bottom line. Attracting new customers is estimated at seven times more costly than keeping existing customers. Fines and legal fees can quickly add up. Publicly traded organizations can see negative and lasting impacts to their stock value, supplier relationships and shareholder perceptions. All these add up to explain why more boards are getting involved in security decisions. FortiSIEM provides organizations with a comprehensive, holistic and scalable solution, from IoT to the Cloud, with patented analytics that are actionable to tightly manage network security, performance and compliance standards, all delivered through a single pane of glass view of the organization. Fortinet has developed an architecture that enables unified and cross-correlated analytics from diverse information sources including logs, performance metrics, SNMP Traps, security alerts and configuration changes. FortSIEM essentially takes the analytics traditionally monitored in separate silos from — SOC and NOC — and brings that data together for a more holistic view of the threat data available in the organization. Every piece of information is converted into an event which is first parsed and then fed into an event-based analytics engine for handling real-time searches, rules, dashboards and ad-hoc queries. External Threat Intelligence (TI) feeds from open source threat intelligence feeds, commercial sources and custom data sources integrate easily into the FortSIEM TI framework. This grand unification of diverse sources of data enables organizations to quickly create comprehensive dashboards and reports to more rapidly identify root causes of threats, and take the steps necessary to remediate and prevent them in the future. Distributed event correlation is a difficult problem, as multiple nodes have to share their partial states in real-time to trigger a rule. While many SIEM vendors have distributed data collection and distributed search capabilities, Fortinet is the only vendor with a distributed real-time event correlation engine. Complex event patterns in realtime can be detected with minimal delay. This patented algorithm enables FortSIEM to handle a large number of rules in real-time at high event rates for greatly increased detection timeframes. Rapid problem resolution requires infrastructure context. Most log analysis and SIEM vendors require administrators to provide the context manually, which quickly becomes stale, and is highly prone to human error. Fortinet has developed an intelligent infrastructure and application discovery engine that is able to discover and map the topology of both physical and virtual infrastructure, on-premises and in public/private clouds simply using credentials without any prior knowledge of what the devices or application is. Discovery is both wide (covering a large number of Tier 1/2/3 vendors) and deep (covering system, hardware, software, running services, applications, storage, users, network configuration, topology and device relationships). 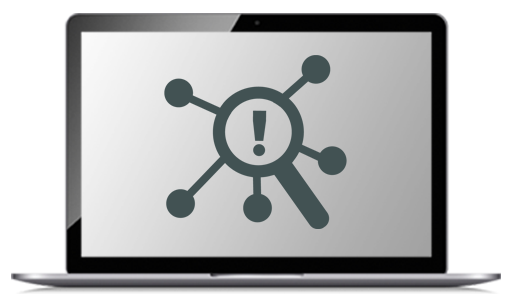 Discovery can run on-demand or on schedule to detect (in real-time) infrastructure changes and report on any new devices and applications detected — this is an essential part of compliance requirement management that FortSIEM is uniquely able to meet. An up-to-date (Centralized Management Database) CMDB enables sophisticated context aware event analytics using CMDB Objects in search conditions. Crucial context for log analysis is connecting network identity (IP address, MAC Address) to user identity (log name, full name, organization role). This information is constantly changing as users obtain new addresses via DHCP or VPN. Fortinet has developed a dynamic user identity mapping methodology. First, users and their roles are discovered from on-premises repositories such as Microsoft Active Directory and Open LDAP, or from Cloud SSO repositories such as OKTA. This can be run on-demand or on a schedule to detect new users. Simultaneously, network identity is identified from important network events such as firewall network translation events, Active Directory logons, VPN logons, WLAN logons, Host Agent registration logs, etc. Finally, by combining user identity, network identity and geo-identity in a real-time distributed in-memory database, FortSIEM is able to form a dynamic user identity audit trail. This makes it possible to create policies or perform investigations based on user identity instead of IP addresses — allowing for rapid problem resolution. Effective log parsing requires custom scripts but those can be slow to execute, especially for high volume logs like Active Directory, firewall logs, etc. Compiled code on the other hand, is fast to execute but is not flexible since it needs new releases. Fortinet has developed an XML-based event parsing language that is functional like high level programming languages and easy to modify yet can be compiled during run-time to be highly efficient. All FortiSIEM parsers go beyond most competitor’s offerings using this patented solution and can be parsed at beyond 10K EPS per node. FortiSIEM takes advantage of two diverse sources of information — discovered information is structured data suitable for a traditional relational database, while logs, performance metrics etc. are unstructured data which needs a NoSQL-type database. Fortinet has developed a hybrid approach where the data is stored in optimized databases with unique business layer logic providing a comprehensive, single database abstraction layer. The user is able to search for events (stored in NoSQL database) using CMDB objects (stored in relational database). This approach harnesses the power and benefits of both databases. There are many sources available for customers to subscribe to external threat feeds in managing potential threats in their network. However, threat feed information can be very large, often reaching millions of IP addresses, malware domains, hashes and URLs, and the information can also quickly become stale as malware websites and domain are taken down and brought up. This provides a significant computational challenge to the consumers of threat intelligence data. Fortinet has developed proprietary algorithms that enable this large amount of information to be quickly obtained from the source, then effectively distributed to various FortiSIEM nodes and evaluated in real-time at higher rates than other providers (exceeding 10K EPS per node). Fortinet has developed a highly customizable, multi-tenant architecture that enables enterprises and service providers to manage a large number of physical/logical domains and overlapping systems and networks from a single console. In this environment it is very easy to cross-correlate information across physical and logical domains, and individual customer networks. Unique reports, rules and dashboards can easily be built for each, with the ability to deploy them across a wide set of reporting domains, and customers. Event archiving policies can also be deployed on a per domain or customer basis. Fortinet has developed a highly efficient agentless technology for collecting information. However some information such as file integrity monitoring data is expensive to collect remotely. FortSIEM has combined its agentless technology with newly developed high performance agents to significantly bolster its data collection. Download the Fortinet FortiSIEM Datasheet (PDF). FortiSIEM licenses provide the core functionality for network device discovery. Devices include switches, routers, firewalls, servers, etc. Each device that is to be monitored requires a license. Each license supports data capture and correlation, alerting and alarming, reports, analytics, search and optimized data repository and includes 10 EPS (Events Per Second). “EPS” is a performance measurement that defines how many messages or events are generated by each device in a second. Additional EPS can be purchased separately as needed. Licenses are available in either a “Subscription” or “Perpetual” version. *Price per license. Quantity must be 150 or greater. *Price per license. Quantity must be 300 or greater. *Price per license. Quantity must be 4000 or greater. FortiSIEM Subscription License for Advanced Agents 1 Year Per Agent Subscription License for minimum 50 Advanced Agents.Does not include Maintenance & Support. FortiSIEM Subscription License for Advanced Agents 1 Year Per Agent Subscription License for minimum 100 Advanced Agents.Does not include Maintenance & Support. FortiSIEM Subscription License for Advanced Agents 1 Year Per Agent Subscription License for minimum 200 Advanced Agents.Does not include Maintenance & Support. FortiSIEM Subscription License for Advanced Agents 1 Year Per Agent Subscription License for minimum 500 Advanced Agents.Does not include Maintenance & Support. FortiSIEM Subscription License for Advanced Agents 1 Year Per Agent Subscription License for minimum 1000 Advanced Agents.Does not include Maintenance & Support. FortiSIEM Subscription License for Advanced Agents 1 Year Per Agent Subscription License for minimum 2000 Advanced Agents.Does not include Maintenance & Support. FortiSIEM Subscription License for Advanced Agents 1 Year Per Agent Subscription License for minimum 4000 Advanced Agents.Does not include Maintenance & Support. FortiSIEM Subscription License for Advanced Agents 1 Year Per Agent Subscription License for minimum 5000 Advanced Agents.Does not include Maintenance & Support. FortiSIEM Subscription License for Advanced Agents 3 Year Per Agent Subscription License for minimum 50 Advanced Agents.Does not include Maintenance & Support. FortiSIEM Subscription License for Advanced Agents 3 Year Per Agent Subscription License for minimum 100 Advanced Agents.Does not include Maintenance & Support. FortiSIEM Subscription License for Advanced Agents 3 Year Per Agent Subscription License for minimum 200 Advanced Agents.Does not include Maintenance & Support. FortiSIEM Subscription License for Advanced Agents 3 Year Per Agent Subscription License for minimum 500 Advanced Agents.Does not include Maintenance & Support. FortiSIEM Subscription License for Advanced Agents 3 Year Per Agent Subscription License for minimum 1000 Advanced Agents.Does not include Maintenance & Support. FortiSIEM Subscription License for Advanced Agents 3 Year Per Agent Subscription License for minimum 2000 Advanced Agents.Does not include Maintenance & Support. FortiSIEM Subscription License for Advanced Agents 3 Year Per Agent Subscription License for minimum 4000 Advanced Agents.Does not include Maintenance & Support. FortiSIEM Subscription License for Advanced Agents 3 Year Per Agent Subscription License for minimum 5000 Advanced Agents.Does not include Maintenance & Support. FortiSIEM Subscription License for Advanced Agents 5 Year Per Agent Subscription License for minimum 50 Advanced Agents.Does not include Maintenance & Support. FortiSIEM Subscription License for Advanced Agents 5 Year Per Agent Subscription License for minimum 100 Advanced Agents.Does not include Maintenance & Support. FortiSIEM Subscription License for Advanced Agents 5 Year Per Agent Subscription License for minimum 200 Advanced Agents.Does not include Maintenance & Support. FortiSIEM Subscription License for Advanced Agents 5 Year Per Agent Subscription License for minimum 500 Advanced Agents.Does not include Maintenance & Support. FortiSIEM Subscription License for Advanced Agents 5 Year Per Agent Subscription License for minimum 1000 Advanced Agents.Does not include Maintenance & Support. FortiSIEM Subscription License for Advanced Agents 5 Year Per Agent Subscription License for minimum 2000 Advanced Agents.Does not include Maintenance & Support. FortiSIEM Subscription License for Advanced Agents 5 Year Per Agent Subscription License for minimum 4000 Advanced Agents.Does not include Maintenance & Support. FortiSIEM Subscription License for Advanced Agents 5 Year Per Agent Subscription License for minimum 5000 Advanced Agents.Does not include Maintenance & Support. For more than 10,000 points, please use our Quote Request Form!